As a mom with children of (or nearing) preschool age, I'm always looking for new ways to package little treats to send with them to school. 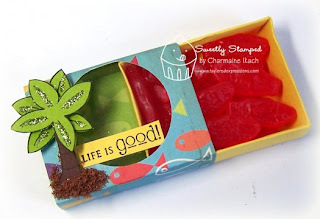 My kids LOVE Swedish Fish, so I thought I'd create a summery treat incorporating fish. The Beach Bum set was perfect for this project. 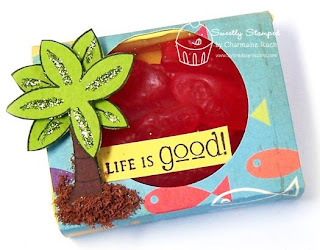 I used the Matchbox Bigz die from Stampin' Up along with paper from the Beach Bum Key Ingredients to create my little treat. I stamped the palm tree on colored cardstock and cut it out, layering the top twice and adding some Parisian Mist glitter. I also added some Nut Brown Flower Soft to ground the palm tree and add more of a "beach" feel. Oh my gosh...how cute!! I love the sparkle, Flower Soft...and that window makes the goodies hard to resist!! Adorable, Charmaine! Love the Flower Soft for the ground! Such a wonderful, tactile touch! I'm with your kiddos...I LOVE Swedish fish too! Yumo! Very cute box, I love the glitter on the leaves and the FS at the base of the tree. SUPER cute! You always have the coolest projects! Thanks for the super inspirations! What a sweet package of treats! You always have the best ideas for packaging, Charmaine!